Doyle tweeted out his design with the following caption: “Is this a dumb thing I drew…or the DUMBEST THING I’ve EVER DRAWN.” I can only assume that he made a mistake and meant to use the word best, because this is obviously the best thing he’s ever drawn. It could be an autocorrect error; that happens. I don’t care what he’s done before or will do in the future, it’s all downhill from here. Sorry, bro, but you peaked. The best part of this is how completely absurd it is. 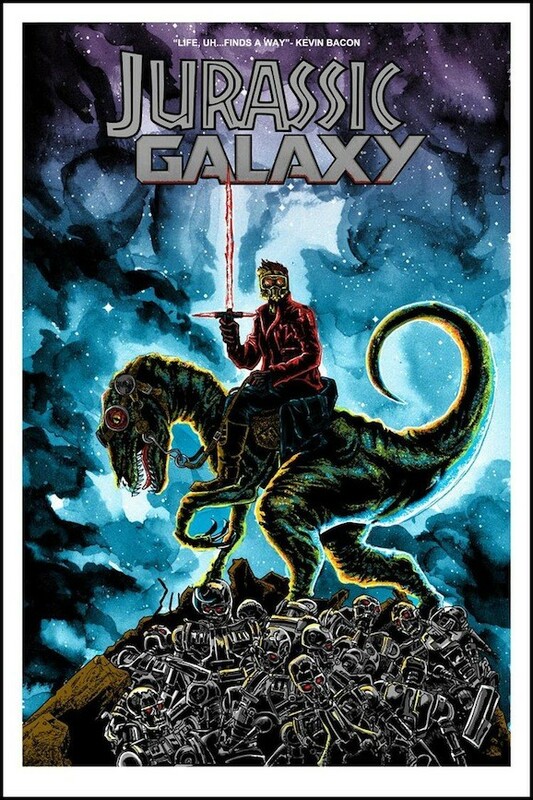 To be honest, I never knew that I wanted to see a rendering of Star-Lord riding a Velociraptor, wielding that divisive new cross-shaped lightsaber, while standing over the husks of dozens of ruined Terminators. I didn’t know I wanted to see this, but now that I have, I can’t imagine why that hasn’t been at the top of my bucket list for years. The second best part is the quote from Kevin Bacon. Between Star Wars: The Force Awakens, Terminator: Genisys, and Jurassic World, this hits three of the movies we’re most excited for in 2015 (the only film that’s up there with these is Mad Max: Fury Road, and it’s weird that all of them are long-gestating reboots/sequels). But we still have a long way to go until we get to any of these, so until then, we’ll just have to satisfy ourselves by binge watching Guardians of the Galaxy over and over again, and that doesn’t sound so bad.